Gondwana was the first recognized supercontinent and as such has played a pivotal role in our understanding of supercontinent cycles. It was one of the largest and long lasting supercontinents on Earth´s history, comprising five large continents (Africa, Australia, Antarctica, South America and India) and many other smaller masses scattered today around the globe (e.g. Madagascar, Sri Lanka, Papua New Guinea, New Zealand, Falklands, and others now embedded in Asia, Europe and USA). Amalgamation of Gondwana complete at ca. 500 million years ago, during the Cambrian period, when marine life was flourishing evolving fast to visible organisms. For more than 350 million years, this supercontinent as an entity moved between the South Pole and the low latitudes of the southern hemisphere. Large intracontinental basins developed and registered the evolution of life on Earth as plants and vertebrates migrated from water to terrestrial environments, culminating with the biggest reptiles in the Mesozoic Era. The continental margins of Gondwana were very heterogeneous. From the present day location of the Andes to the Papua New Guinea, active tectonics predominated, with subduction zones, collisions and accretion of new terranes along the Gondwanides. The northern margin of Gondwana – facing the Tethys ocean – was entirely different, with stable, wide continental shelves and shallow seas from Northern Africa to Papua New Guinea. This extensional tectonic setting allowed small continental blocks to separate from Gondwana, drifting away to be deformed and welded onto Laurasia. Finally for about 100 million years, starting ca. 200 million years ago (Jurassic period), Gondwana started to break up into several land fragments evolving steadily into the present-day picture of the continents and oceans on Earth. Gondwana research involves the understanding of the evolution of our planet, its climatic, thermal and tectonic processes and the evolution of life itself. Since 1872, when the geologist Medlicott identified the Gondwana flora in India, through the definition of the Gondwana Land by Suess in 1885 and the first maps by Wegener and Du Toit in the dawn of the twentieth century, this major subject has been investigated by many scientists worldwide. A new geological map of Gondwana was published in 1988 by the AAPG, conceived by Prof. Maarten de Wit and his colleagues in South Africa. Much new data, particularly based on modern geochronology has been generated since, and our proposal “The Gondwana Map Project” aims to update the Gondwana Map of de Wit with an approach of the 21st century. Since 1988, the geological data for the regions concerned have improved incredibly in the wake of new geochronological laboratories and investigative methodologies. Thorough airborne geophysical reconnaissance has been extended across most parts of the constituent continents. A new GIS data-base is planned, with a dynamic digital process that will allow the construction not just an improved Gondwana Map but also a wide variety of maps showing the evolution of this supercontinent. Geophysical advances at continental margins and oceanic floors, the modeling of the restoration with new software and the analysis of satellite imagery permits scientifically rigorous reconstruction of Gondwana. The main products will be: (a) a new Gondwana Map and sets of thematic maps showing its evolution through time; (b) a website providing to all the geological data taken into the project at the Gondwana Digital Center of Geoprocessing (GDCG); (c) three complete book volumes about Gondwana; (d) new detailed geology of key areas for correlation; (e) an interactive 4-D GIS of Gondwana (f) creation of a permanent exposition at the Gondwana Memory Center (GMC), in South America, with specimens representative of all parts of Gondwana; (g) generation of didactic booklets and maps of Gondwana to students. This project includes vast international collaboration between scientists and students, universities, surveys and global institutions. This is the only way to integrate scientific thinking about Gondwana. In order to promote this integration it is essential to have undergraduate and graduate students from many fields, making their dissertation and thesis on subjects within the project. The main issue is to get students from developing countries to access developed countries laboratories and universities. This integration is fundamental for the achievement of this project. It is important to stress here that Gondwana was formed mostly by the territory of actual developing countries. Africa is the key continent to be mostly included scientifically during this process of the Gondwana Map. All these digital tools, allied with the essential basic geological data will help scientists to review and improve the knowledge about this supercontinent that played a major role in the evolution of the Earth. These conclusions allow a better understanding of the global geological processes that today affect our lives. This is one alternative to harmonize a sustainable future on the planet. This Project was first discussed in 2008, when Milani (PETROBRAS) and Schmitt (UFRJ) proposed Brazil as the venue for the Gondwana Conference 14, during the Gondwana 13 Conference in Dali (Yunnan Province – China). During this meeting the International Gondwana Committee discussed and approved Brazil as the next venue. In addition, the committee suggested that a project to build a new Gondwana Map should be proposed by a group of scientists. At that time, the main argument was that this ambitious enterprise was essential for the world scientific community and for the knowledge of the continents and their margins. Back in Brazil, Schmitt and Milani discussed the possibility to propose this Project with the financial support of PETROBRAS, the Brazilian Petroleum Company. Milani coordinated for more than a decade a group of scientists of South America and Africa that discuss regularly the correlation between these two continents, with emphasis on the Paleozoic and Mesozoic sedimentary basins. Schmitt coordinates two international projects of correlation between Africa and South America, with emphasis on the mobile belts of Brazil, Uruguay, Namibia and Angola. 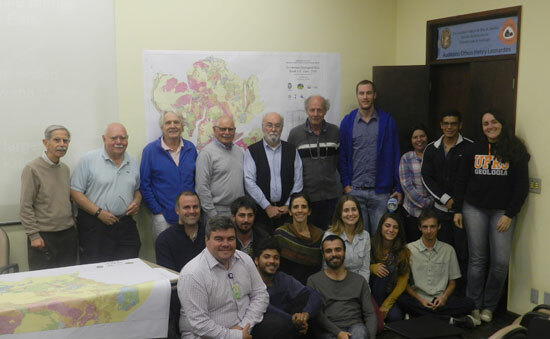 In the end of 2010, the Gondwana Map Project was proposed by the UFRJ team and approved by PETROBRAS, which gave five years to the UFRJ group to deliver the map and its additional products. 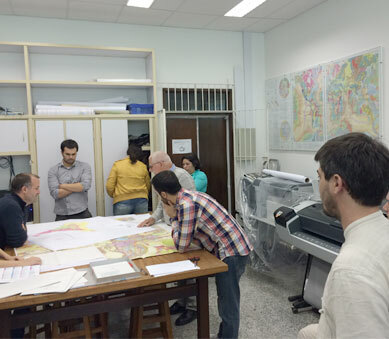 A new geoprocessing digital laboratory was conceived located at the Universidade Federal do Rio de Janeiro (UFRJ) and a group of four specialized professionals on cartography and geology are working at the lab since the beginning of 2011.Parallel to this, the UFRJ group organized the Gondwana 14 Conference, which was held in Búzios, a cozy resort located at Rio de Janeiro State, southeast Brazil. 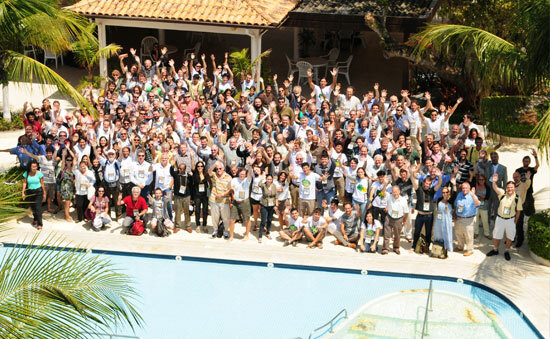 The meeting was a great success with scientists from more than 35 countries. 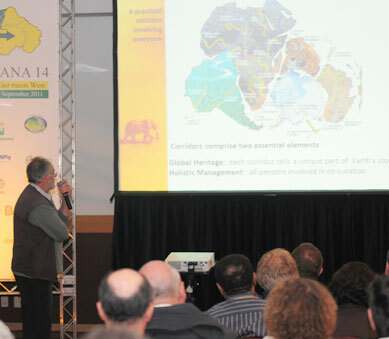 During the Conference, Schmitt and Milani presented officially the Gondwana Map Project to the Gondwana Community. A one day workshop addressing the challenges of building up a new Gondwana took place on the 25th of September. The initiative to propose an IGCP project (International Geoscience Program) was discussed earlier (July-August-2011) with the Commission for the Geological Map of the World (CGMW) during the Latin American Geological Congress in Colombia. Schmitt contacted Dr. Philippe Rossi (President of the CGMW) and they discussed that proposing an IGCP project for the new Gondwana Map would be very important for increasing the support and collaboration of scientists around the globe. In addition, the partnership and support by UNESCO would promote the project and help to apply the results of this project worldwide special in developing nations. The Gondwana 14 participants fully supported and agreed on the proposal of an IGCP project about the Gondwana Map. A group of 60 participants signed a book of invitation to be part of an IGCP proposal and agreement during the meeting. In the next years, other one hundred scientists joined the project. In 2013, UNESCO approved the proposal, through the IGCP committee, in the theme “Geodynamic: control our environment”. The project was named IGCP-628 “The Gondwana Map Project– the geological map and the tectonic evolution of Gondwana”. The IGCP-628 has duration of five years, from 2013 to 2017. In 2015, PETROBRAS approved an extension for its financial support for the Gondwana Map project to 2018.